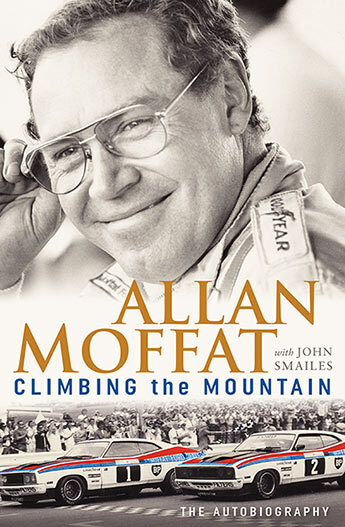 Born in Saskatoon, Saskatchewan, Canada, Allan Moffat raced Cortina and Cougar in ’60s Trans-Am, then moved to Australia, where he won more than 100 Touring Car races from ’65-’71, including three Bathurst 500 victories, one leading from pole to flag. Co-drove with Brian Redman to ’75 Sebring 12 win, and co-drove with Bobby Rahal in ’80 Le Mans 24. Moffat won the Australian Touring Car Championship four times and the Sandown 500 six times. He is one of only two drivers to have won The Great Race at Bathurst in both formats – 500 miles and 1000 kilometres. He was inducted into the V8 Supercars Hall of Fame in 1999 and became an Australian citizen in 2004. After he retiring from driving, he became an expert commentator on motor-sport telecasts for Channel Seven, Channel 9 and the ABC. Moffat’s autobiograpy was published in late 2017 and is available from Allen & Unwin Book Publishers.